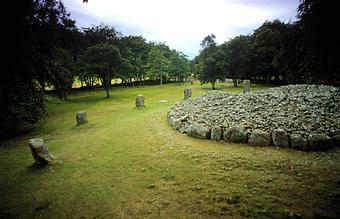 This notable site comprises three huge cairns of stones, each surrounded by a circle of shapely standing stones in a formation nearly unique in the British Isles, but similar to those of Loanhead of Daviot (Scotland) and Newgrange (Ireland). The cairns are variations on the same design and all have an outer kerb and an inner chamber built of large stones. The circle surrounding the cairn nearest the entrance is 31 m (103 ft) in diameter; the cairn can be entered along a passage. Both passage and central burial chamber are now open to the sky, however, as is the case with all three cairns (though the central cairn has no entrance passage). Bones were found in the first cairn during the 1828 excavation, the second cairn revealed flint flakes during the 1857 excavation, and the cairn furthest from the entrance contained just a few bones when excavated in 1858. Cup marks are on some of the stones. From the limited evidence available, it seems that the Clava cairns were not burial places for communities, but for selected individuals, both male and female. Professor Alexander Thom discovered that the two entrance passages align exactly and that the alignment passes through two of the stones surrounding the central non-aligned cairn. The significance of this is that the passage graves were probably constructed in Neolithic times, and the stone circles later, during the Bronze Age. The alignment points to the midwinter sun's setting position, indicating that at some time the site perhaps had an astronomical function. Cairns like those at Clava are found mainly in the area around Inverness and the Black Isle, and the Spey Valley. Their distribution coincides largely with areas of good farmland, and often the smallest stones of the mounds have been almost totally removed for the construction of dykes and farm buildings.